Growing a vegetable garden in a hot climate region can be particularly challenging if you do not choose the right varieties to grow. 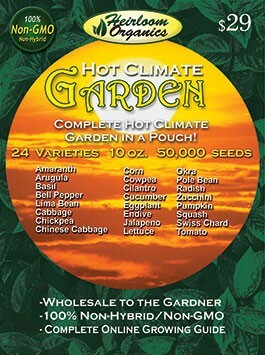 Heirloom Organics makes it easy for you to be successful with the complete Hot Climate Garden in a pouch. Featuring 24 varieties, over 40,000 seeds (9oz. ), this complete garden kit provides you with whole sale quantities of seed in a very inexpensive complete garden pouch. Vegetables are classed as either warm- or cool-season, depending on the weather they need for best growth. Warm-season veggies require both warm soil and high temperatures (with little cooling at night) to grow steadily and produce crops. They include traditional summer crops such as snap beans, corn, cucumbers, melons, peppers, tomatoes, and squash. “Winter” squashes are actually warm season crops: the name refers not to the planting season, but to the fact that they can be stored for winter consumption.